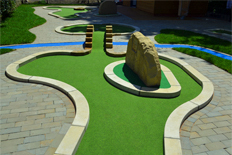 After 30 years’ service, the old minigolf course in Barnard Castle, County Durham was beginning to ‘show its age’ and so the local Town Council decided it was time to replace it. They set about finding a company that could design and build a suitable replacement and we are delighted to say that, following a vigorous procurement process, we at UrbanCrazy were awarded the contract. At UrbanCrazy, we like to give our customers a whole host of entertainment options for their events. 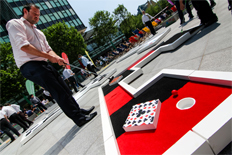 When we are booked to provide a portable minigolf course we are often asked whether we can offer any extras, to which we have a 1001 answers. Well, not quite, but almost! It all went a bit crazy at the Westfield Shopping Centre in Merry Hill last Friday and the men in white coats had to be called in. Actually they were 10 children from St James’s C.E. Primary School who won a competition to be the official testers of the new Quest For Golf adventure golf course, designed conjointly by UrbanCrazy and Paragon Creative. Chris Harding, 2 times World Crazy Golf champion, also came along to put the course through its paces and offer some hints and tips to the school children.